On December in 1996, China Academic Journals (CD-ROM) was officially released. On June in 1998, China Academic Journal (CD) Electronic Journals Publishing House Co., Ltd. (CAJEPH) was established officially and Standardized system of Chinese academic journals was formally started. On June in 1999, China National Knowledge Infrastructure (CNKI) project starting ceremony was held in the hall of Tsinghua University. On October in 2003, CIKRD consultative and editorial Committee was established in the People's Congress Hall. On January in 2005, CNKI formulated the first standards of database product and service—Standards of CNKI Database Products and Technology Service. 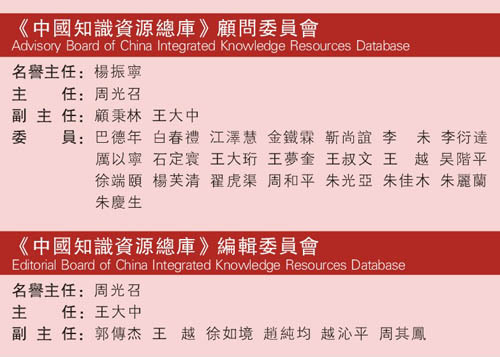 On October in 2006, China Academic Journals Full-text Integrated Database passed the Identification and acceptance of GAPP. On April in 2008, CNKI signed the cooperation contract with Springer that is the famous academic publishing company. On October in 2009, CNKI unveiled construction project of the oversea digital library together with global famous publishing institutes in 36th Frankfurt Book Fair. Copyright©1998-2019, China Academic Journal (CD) Electronic Journals Publishing House Co., Ltd.